Smartphones have become an integral part of our lives, their omnipresence unlikely to fade much in the near future. It’s no secret the one product all consumers seem to have these days in their pocket or, more frequently, their hands is a sophisticated mobile phone. From games and social media to shopping online, mobile phone applications have become a major part of the 21st-century collective lifestyle. Even more so than a mobile optimized site, a personal business app can attract millions of active users, and for the right kind of app, millions of dollars in revenue. As a designer, you are no stranger to the need for apps for your clients who own small businesses. 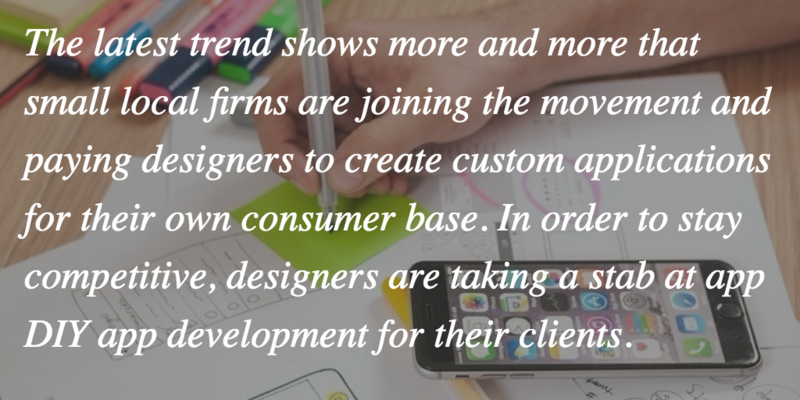 In fact, the latest trend shows more and more that small local firms are joining the movement and paying designers to create custom applications for their own consumer base. In order to stay competitive, designers are taking a stab at app DIY app development for their clients, and it appears to be working. Mobile apps are a wise choice for designers who wish to service their modern small business clients. They create a personalized virtual business-consumer relationship that keeps the focus on customer interests and demand. If you are a designer looking to generate more revenue, you should consider developing mobile apps for your customers to keep ahead of the game and stay relevant. When you are ready to start building, here are seven tips to consider when you are building your first app. You may not know where to start when it comes to developing an app. You might even be concerned that an app is difficult to put together, requiring a lot of money up front, consultation and pricey platforms to get you started. This couldn’t be further from the truth. Five years ago, you customers might have expected to pay a hundred thousand dollars or more for a custom-built app. Thankfully those days are gone, and app-building is now faster, easier, and better than ever. And, as a designer with some basic skills, you can use a CMS platform to get you started. Any marketing or ad campaign is an extension of your client’s business. Mobile apps are just one more way to market their business and amplify their brand recognition. 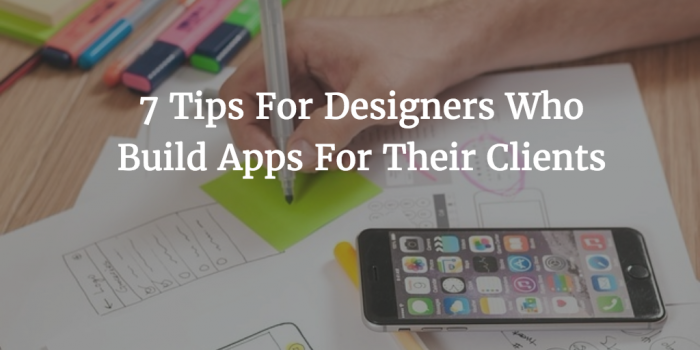 There are a few things to keep in mind when you are creating apps for your clients. The first of the tips for designing apps is marketing. Tools for marketing are crucial. If your clients’ brands are seen or heard at least twenty times by any prospective customer, it’s enough to foster recognition. If their brand is also sending out notifications and is easy to interact with virtually, it has even more staying power. Think of all the notifications you receive on your phone daily. Now think about how often you check your notifications versus how often you log into your email. There isn’t anything quite like having an icon right in your mobile phone’s menu reminding you of your favorite Chinese takeout place, local boutique, or anything else in between. Also, be sure to incorporate features like push notifications and geo-fencing into you the development of their apps that will remind their customers about their service. Make sure the app you design has the features that will allow businesses to respond to customers quickly and efficiently. It helps them keep their reputation and image strong. Their app is a powerful channel for communication and interaction, and the most convenient one as well. Unlike a website–even a mobile friendly website–a business app gives customers the chance to communicate with a business 24/7. A mobile app will show customers that a business cares about their feedback. Apps are also a great way to promote sales and events put on by your customers’ businesses, driving customers to their online store and helping them easily make purchases more frequently. In other words, be sure your app is perfect for giving any businesses’ targeted and personal service whenever they need it, and improving your brand’s image overall. An obvious win-win for you as a designer and for your clients’ businesses. 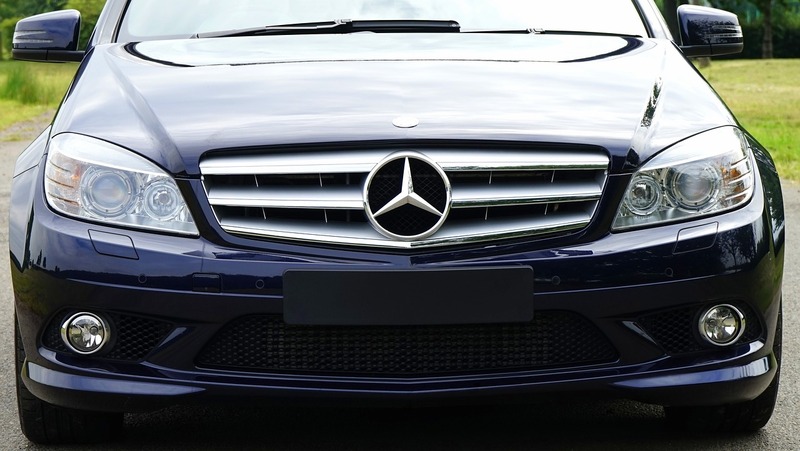 Customers appreciate when a business makes a proactive effort to stay on trend and keep them happy. You can show your base how much you care by designing an app that offers your clients’ quality customer loyalty rewards facilitated through their app. 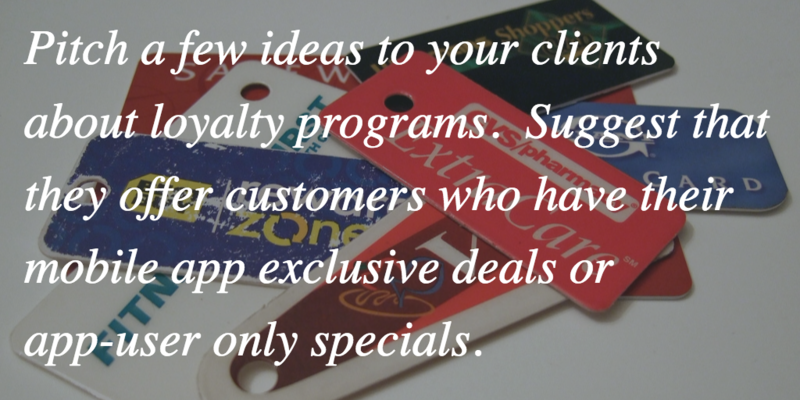 Pitch a few ideas to your clients about loyalty programs. Suggest that they offer customers who have their mobile app exclusive deals or app-user only specials. People love to use coupons, rewards, and punch cards at retail stores, but in the 21st century, remind your clients that these antiquated channels are increasingly being replaced by digital solutions. Point out how to use rewards. Advise them to offer customers rewards for their loyalty and business by turning their mobile app into a virtual punch card they’ll keep with them at all times. Designers should especially remind their clients that when they are a single finger-tap away from their customers, those customers soon come to love and recognize their brand, as well as the rewards and savings they’ll enjoy. You should also consider offering ways that their app will benefit them as well. If you can find a way to design an app to run their business more efficiently, you will be doing them justice as well. Point out how mobile applications make life easier for everyone in their company. A mobile application can complete complicated or even tedious tasks, literally taking them out of the hands of them and their busy employees. In-app schedules can make booking an appointment at the salon a breeze, as well as provide customers an answer to their question much faster than a phone call might. Apps cut down on time spent laboring on menial tasks, giving your clients back time to focus on their business. Designers know pictures and how art and colors work great together, but don’t forget the numbers. You should always use some data to pitch your app ideas to your clients. Here are some great stats that can help sway your customers to choose you to design their apps. 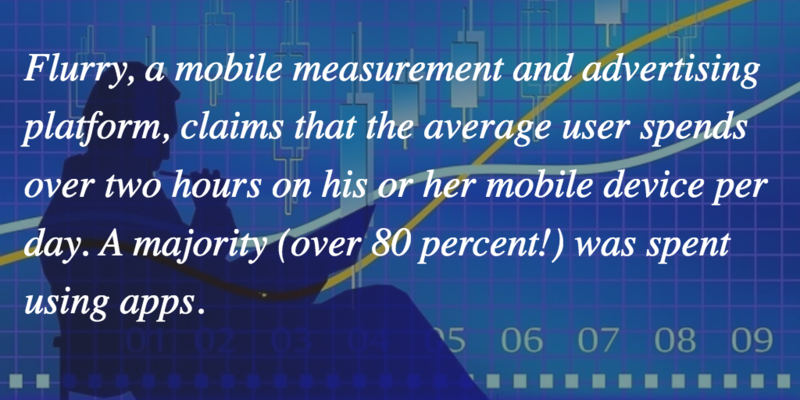 Statistical projections of the growing market for mobile apps shouldn’t come as a surprise. Mobile app downloads are expected to more than double between 2015 and 2020. In 5-10 years, some part of all age groups will be shopping on a mobile phone. Millennials, of course, dominate this space with sixty-nine percent already making mobile purchases through apps on their smartphones. Fifty-three percent of Generation Xers and about 16% of Baby Boomers are following suit. Mobile phone use and mobile applications are on the rise among all consumer populations. Furthermore, Flurry, a mobile measurement and advertising platform, claims that the average user spends over two hours on his or her mobile device per day. A majority (over 80 percent!) was spent using apps. The rest was from browsing the internet. If you want to reach customers, be sure to look at the data to guide your decisions. Mobile applications that genuinely meet the needs of consumers will certainly increase your bottom line. Show your clients how much care you about their business. An app you design for a small business signals that both you and the business you design for are trendy and part of the modern tech age. It also demonstrates that that business cares about its customers, and wants to provide them the best, most personalized experience on tap. If the statistics teach us anything, it’s that if a company is not interested in a mobile application for now, there’s a good probability that business will be kicking the can down the road. Chances are they’ll end up making one in the next five years or so. Point out that it’s wise to develop one now, being one of the first in the field. And then remind them about how your ability to design will give their app the most appeal. Showing your customers that you stay ahead of the times and the latest trends is a great way to impress them and help generate buzz. Designing a nifty app is a sustainable and cost-effective way to turn stay abreast the design industry all the while making heads in your field and with your customer base. A quick Google search for a designer usually provides your potential customers with an overwhelming number of possibilities to choose from, with ads and recommendations providing even more options. If your design firm is small and local, it might get lost in the jumble when the pool is so enormous, but when you add another growing service to your repertoire, you will stand out amongst the competition. With the growing ease of affordable mobile application development, this alone makes adding app design and development options for your small business clients a virtual no-brainer. The future is in mobile applications. In fact, even the present is in mobile applications. If larger companies can profit from valuable apps, you just need to consider what you and your app development future need to succeed. With these 7 tips for creating your first mobile app for a client, you can show your customers how you are a designer who is ahead of the game! For additional visual reference, you can also check out this infographic. This post was written by Andrew Gazdecki, CEO at Bizness Apps.